To realize the Joy of Giving and Determined to bring in Social Change, we, at Mynique Hygiene have launched the Donate A Pad initiative! Donate any amount and We will Donate Sanitary Pads to the poor Girls and Women who still don't have access to this most basic need. Even in today's highly ‘Social’ world, Millions of Girls and Women around the world are deprived of the Knowledge and Access to this Most Basic Need. They're forced to use Highly Unhygienic and Demeaning ways such as cloth and sometimes even Sand! This, puts them at grave risk of Irritation, Infections and sometimes even Lifelong diseases and ailments. While most of us take many such small things for granted and don't realize how Fortunate we are. We at Mynique Hygiene wish to change the status quo and wish to work towards ensuring that every girl or woman has access to at least such basic needs of Sanitation and Hygiene. Any amount you donate will be used to buy and donate Sanitary Pads to such women in need. It will be a completely transparent and safe process as we'll be posting regular updates on our Facebook and Instagram pages along with the milaap page. You may also have a look at our Website and App. 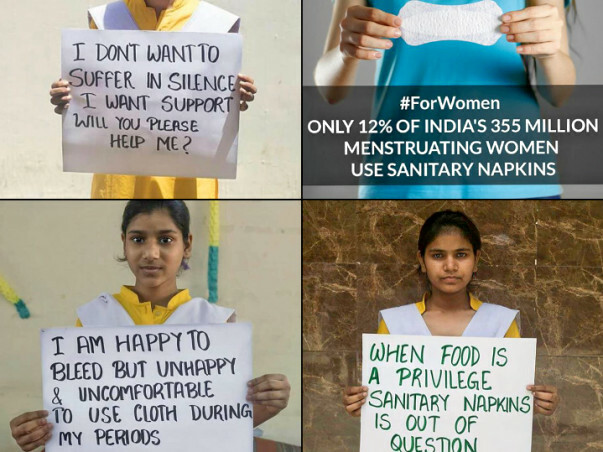 Thus, We have started this campaign to challenge Each and Everyone of you to help us in donating sanitary napkins to those who don't know the What Is and How To's of sanitary pads. The users may join us to experience the Joy of Giving and help us distribute Smiles and Hygiene to the poor girls and women. Accept the challenge and take the movement forward by further nominating your friends to Pay for a Good Deed. Make your contribution to Women Empowerment! Contribute any amount we will distribute the Sanitary Pads to those who need it the most.